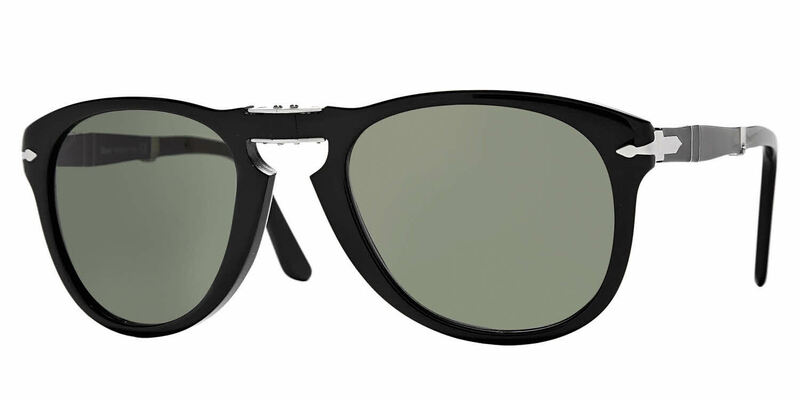 Persol PO0714S Folding Sunglasses, also known as the Steve McQueen sunglasses, are the last word in cool and distinguished. Plus, the frame folds into a convenient case that's half the size of a normal sunglasses case - smooth. Patented folding frame folds at three different points, one each temple and at the bridge. Durable hinges at all folding points. Easy to wear rounded teardrop lens suits many face shapes and provides great coverage. The end pieces feature the iconic metal Supreme arrow (inspired by the sword of ancient warriors) and is crafted by hand. The temples feature the Meflecto system (nylon pieces inserted in the plastic temples) which gives maximum comfort to the wearers by limiting pressure on the side of the head. Each frame comes with a black Persol case and a cleaning cloth. I picked up a folding Persol Sunglasses from with FramesDirect and saved over $100 vs retail and take them with me around the world for travel. They are super easy to fold and save space and they are a classic look. These are my first folding sunglasses. I got tired of losing sunglasses because I had nowhere to put them. These fold up nicely and fit in a pocket so they can't get lost. The glasses fit well and are nicely made. The optics are great. They're nice glasses. Well built, stylish and I love the gradient lenses. The only thing is they are quite large (I did get the bigger size). I wonder if the smaller ones would provide the same amount of protection as the larger lenses? Either way, they're a nice pair of sunglasses. Hopefully they don't get squished in my bags since Persol just provides a soft case for them, though.